Payment by PayPal Shipping in Continental USA is free ! Ironstone or stone china is a high fired white pottery recognized by its heavy weight and dense body. The original body was produced by Turner in 1800. Mason in 1813 patented "Ironstone China" and Spode and Davenport made "Stone China". Many other British manufacturers also produced similar wares. Practical, sturdy and resistant to chips it soon became popular for everyday use. In the early years it was decorated in bright colors often in Oriental style patterns. "Japan" Imari style design of peonies and vase in bold colors. Blue trellis border. Pattern #5054. "Imperial Stone China" mark. DESSERT DISH, 10"long. Stone china( Ironstone). Decorated with an "Imari" or "Japan" design of a peony and bird in underglaze blue,iron-red and green,gold accents. Pattern #107 in red on back. TEAPOT. 6-1/2"high. "Castleford type". Porcellaneous stoneware. White with blue accents . Oval panel form with parapet. Molded with leaves and columns , the two panels with Classical figures. Cover with bird finial. SAUCE TUREEN AND STAND, 4-3/4" high ,7-1/2" long. Printed Armorial for the "City of London Commercial Club"; Oriental pattern,underglaze blue and over-painted in enamels, the handles as animal faces. Printed mark. PLATE, 10-3/4"diameter. 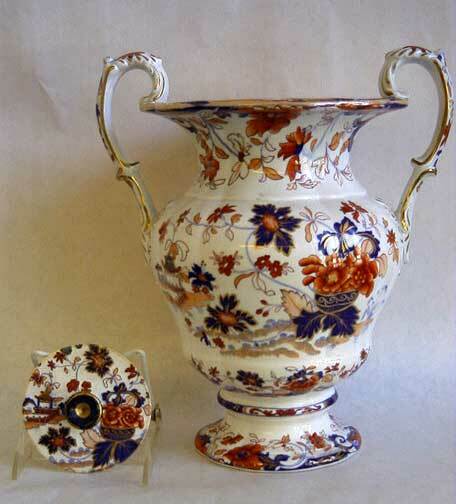 Imari pattern in underglaze blue, iron red and gold. 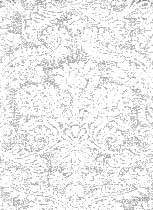 Pattern # B3694. Printed and impressed mark.